Good Morning, good morning! Almost the end of July, can anyone tell me how that has happened?! 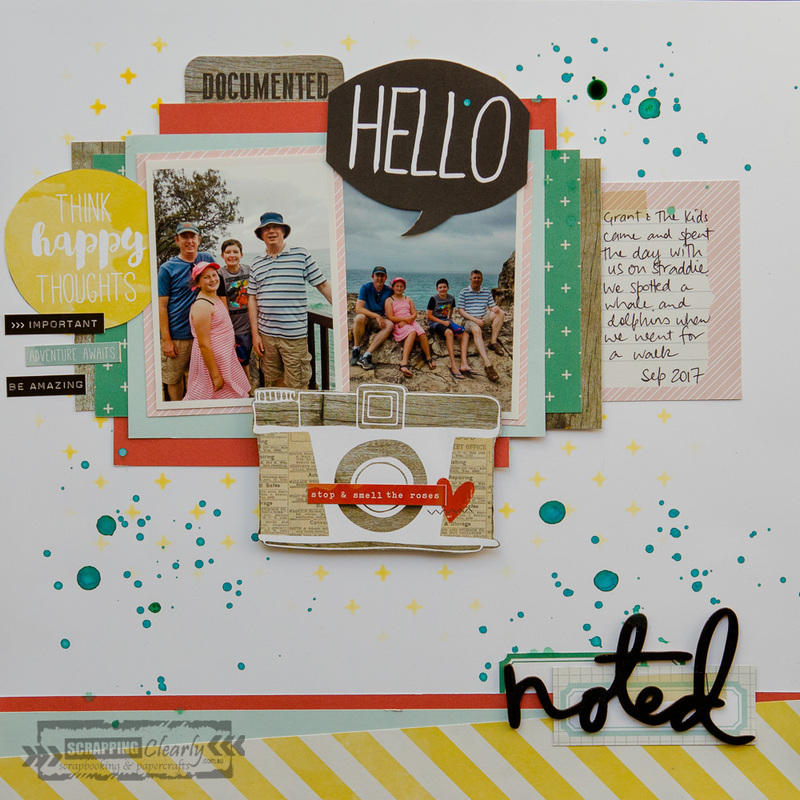 I am popping today to share a page that I created using the fun and versatile Simple Stories Life in Colour collection. Simple Stories are great with their papers as they provide a mix of full patterned papers as well as sheets of 4x6, 3x4 and 4x4 sized cut a-parts for using in general scrapbooking or project life style scrapping. 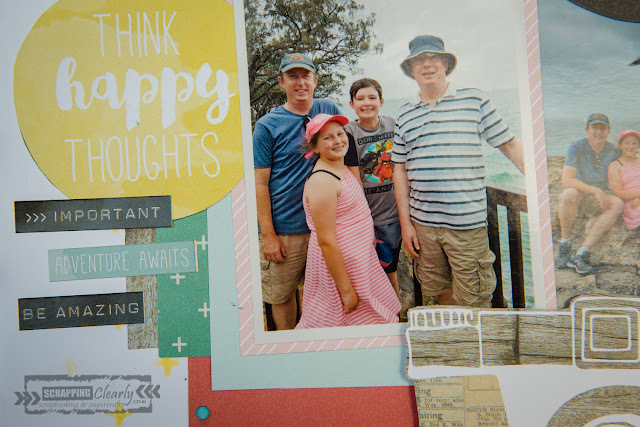 The page that I am sharing today is a standard 12x12 scrapping page, and I show how you can still use all those project life style pieces in a regular page. 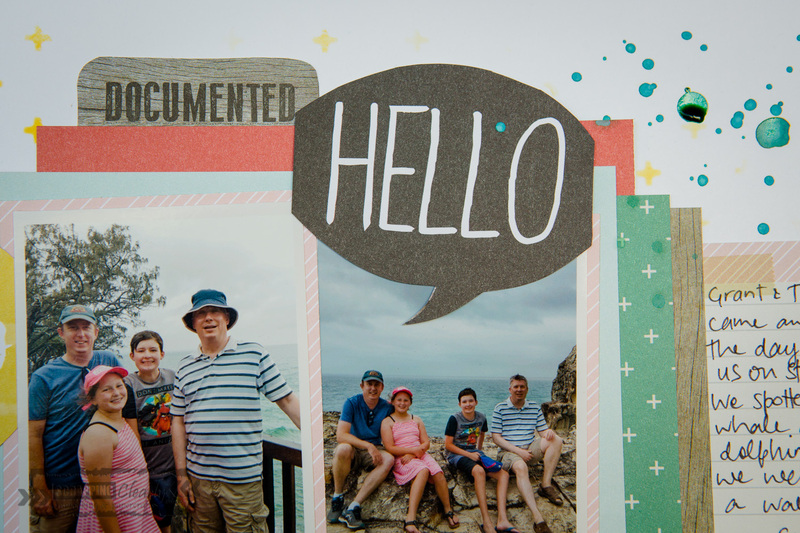 So most of page utilises the full sheets of patterned paper for matting the photos and layering. I have used these papers: Coral water colour /Light Blue water colour, So Much Happiness, Happy Little Moments and Big Memories. Then I used some of the cut apart sheets and actually cut out shapes and icons to use for some of my embellishments. So the camera, the speech bubble and painted word circle and the documented tab all came from these sheets: 3x4 Journaling Card Elements and 4x4 and 4x6 Vertical Elements. I also did some stencil work on the background using my favourite ink, Distress Oxide in Fossilized Amber and I wanted to carry through the plus sign in one of the patterned papers so I used an old Kaiser Craft stencil from my stash which is small plus signs. This is subtle but helps break up the starkness of the white and carries through the pattern and colour. The Documented tab came from the bottom of another element on a 4x3 card, and the wood paper elements that are included in the layering behind my photos are scraps from cutting out the camera. It is a good lesson that not everything needs to be used in the obvious way that it might be intended! 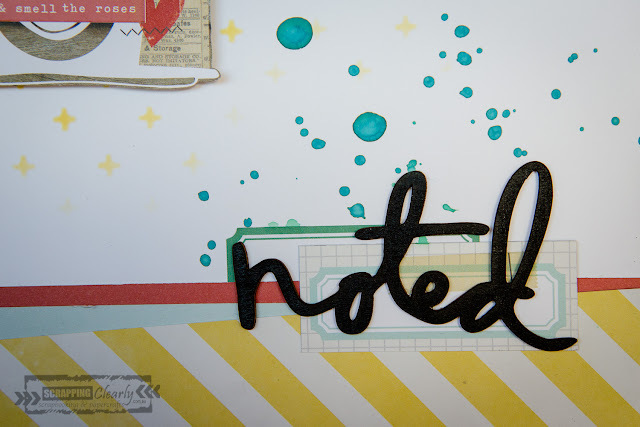 I have also used lots of phrase stickers from the Expressions Cardstock Stickers sheet. This is awesome because it also has four different alphabet sets of different sizes and colours that you can use! To finish off the page I cut and layered some strips of the solid papers and placed them right at the bottom of the page. I cut some labels from the 3x4 Journaling Card Elements paper, these were great to form a base for my title. Then, because you know me, I like simple and quick, I used a wood veneer word from Heidi Swapp for my title. And to finish off I wanted a little bit of splattering in a darker colour so I mixed Salty Ocean and Lucky Clover Distress Oxides with a little water and made a bluey-green colour to splatter with, and hey presto my page was finished! 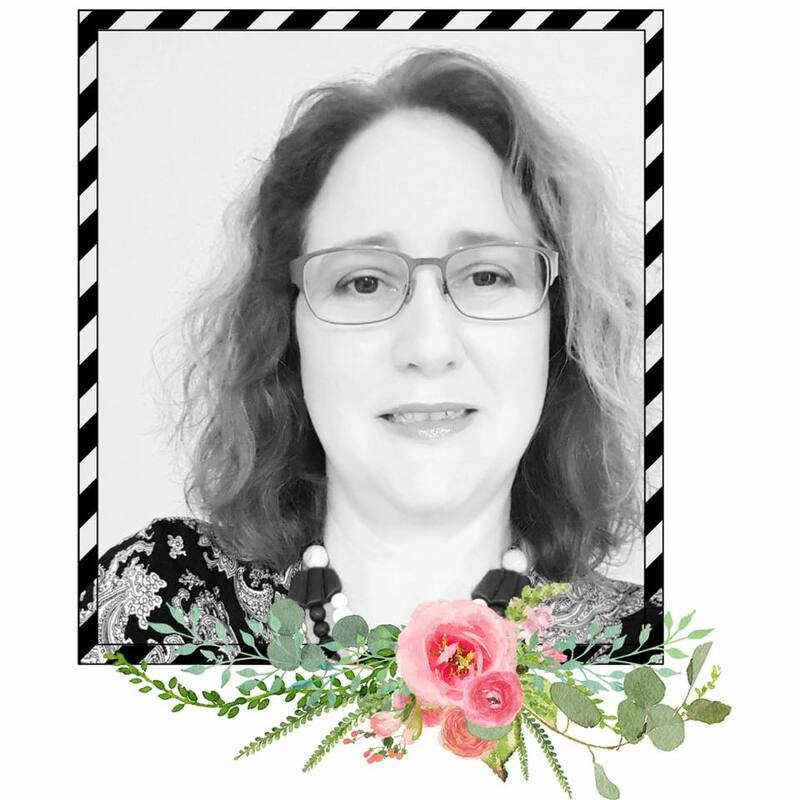 Fancy - With Karyn Schultz! Art Journal Essentials - Q & A. Alcohol Ink Birthday Cards - With Karyn Schultz!